I'm not much of a fan of old English Royalty type films. This movie however is an exception. It explores the battle of wills between Sir Thomas Moore and King Henry the Eighth. The battle, of course, stemmed from the King wanting his childless marraige to his wife Anne annulled. Sir Thomas' silence on the subject was tantamount to a rebuke of the King as well as the hypocrisy of the aristocracy. Retribution was sure to come. And come it does. 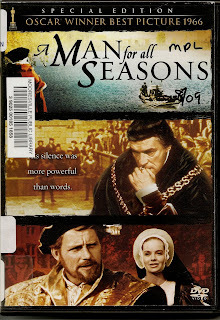 With strong performances from Shaw as the King (he positively roars at times)and equally matched by Paul Scofield as his quiet but firmly defiant Royal Adversary,this film will keep you engaged and interested. The direction keeps the film flowing and the portrayal of Oliver Cromwell by Orson Welles will chill you with it's utter ruthlessness. And I hope you don't.